I have a small family. Growing up, I did not have a lot of experience with death and dying. My grandmother died when I was maybe 5. I think I must have been 16 years old when I saw my first viewing. As a rule, my family never made a big deal out of the funeral thing. Cremation – no ceremony. As I’ve gotten older, I’ve noticed a strange thing – people I know are dying. Imagine that. So, it appears that at some subconscious level I’ve discovered a very personal way of preparing to deal with the inevitable. I’d like to share this with you. DENIAL – This cannot be happening! My father was FINE last week! ANGER – Bastards! Doctors! I’ll sue them! What did he do to deserve this? He worked like a dog all his life, and for …this?! DEPRESSION – He’s gone….what does anything matter now? ACCEPTANCE – It’s been a year now and … life goes on. Grief is a reaction to significant loss. There is no right or wrong way to do it. Identifying the stages and giving them names is a tried and true method of attaining a sense of control in a particular situation. While this is important, I would submit to you that we rearrange the steps a bit and place ACCEPTANCE at the top. Maybe for some of us this would minimize or even eliminate the other feelings. This could help us handle death in a more rational manner. 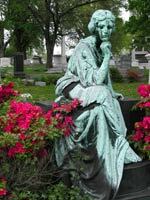 Why do you take pictures of cemetery statuary? As I’ve been doing cemetery photography for about 8 years, I recently began to contemplate this question. People have asked my why I do it, and I’ve never been able to answer the question in a nice tidy manner. Not being a terribly introspective person, I simply thought it was because I liked the images I created-some beautiful, some grim, some even macabre. The fact that others find meaning in my work is an unexpected gift. However, the question remains– why do I do it? The creative process of photography has always helped me deal with the world, with personal issues, and even to judge myself. In retrospect, psychiatry would’ve been cheaper. However, I believe that spending time in cemeteries, creating art, meeting people in the business, etc. has helped me ACCEPT the idea of death as a less abstract concept. In his song of the same name, Bob Dylan expresses our basic feeling of loss, after all Kubler-Ross’ gingerbread is trimmed off. We’ll miss the person, and the loss may even create a massive hardship, but after a time the past always has a way of being, well, past. Preparing yourself before the actual event takes place helps you deal with the event more effectively. This is true no matter what the event is-an exam in school, a public speaking engagement, settlement on a house, and yes, even death. In the Victorian era, people were not only well prepared for death, but they continued to officially mourn for a year! Women would were all black. Men might wear a ring with an enclosed lock of the deceased’s hair. Even today, Hebrews go to synagogue every Friday for a year when a loved one dies. Humans take comfort in ritual, and are made anxious by change. The book, Mourning Art & Jewelry, fully documents this aspect of our psyches. For the uninitiated, garden cemeteries are essentially outdoor sculpture gardens, conceived in Europe in the Victorian era to try and dispel some of the fear and bleakness associated with death and dying. People nowadays typically don’t venture into a cemetery unless they have to. For me, I believe that spending time in cemeteries has helped me to prepare myself for the loss of loved ones. So, will any cemetery do? And what do I do while I’m there? What is There to Do in a Cemetery? To begin with, you don’t have to be religious, although there certainly are Hebrew, Asian, Catholic, and Nondenominational cemeteries to visit. Usually, you don’t have to explain to anyone why you’re there. They don’t charge admission (unless you decide to become a permanent resident).You may want to spend some time poking around by yourself, or go with a group. Larger (and especially historical) cemeteries often have tours. Examples are Laurel Hill Cemetery in Philadelphia and Mount Auburn Cemetery in Cambridge (near Boston), Massachusetts. Visit their websites, perhaps something will spark your interest. Go for an hour every few months. Visit different cemeteries. Talk with the people in the front office if you feel brave enough. Ask the gardeners what their favorite monuments are. See if there are any famous people buried there. Whatever you decide to do in the cemetery, the key is to do it now. With experience, you’ll begin to accept your own and others’ mortality. At that point you will be more capable of accepting the mystery and inevitability of death.